If you’re not sure what to do in our great downtown parks, DSA’s latest art installation, PLAY, spells it out for you – literally. Each letter of the word PLAY stands five feet tall, and together they form a 20-foot-long reminder to take a break and enjoy yourself. Conveniently, there are plenty of opportunities to do just that only steps away. 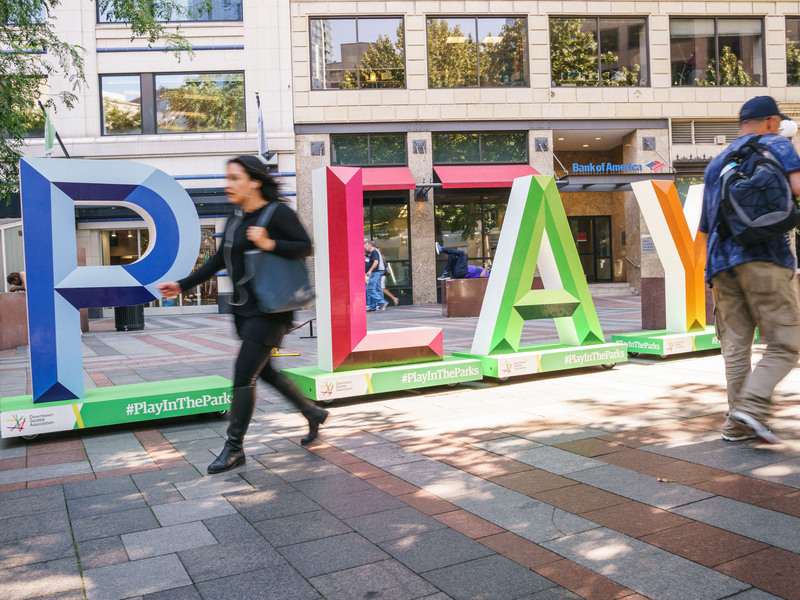 Both Westlake Park, in downtown’s retail core, and Occidental Square, in historic Pioneer Square, offer a variety of daily games and activations – from ping pong to foosball. All-ages amusements are accessible year-round in Westlake and Occidental, with special activations like our holiday carousel rotating in annually. Permanent attractions, including the spherical jungle gym in Westlake Park, are irresistible to young climbers, and basketball hoops in Occidental spur friendly competition whether you’re wearing, sneakers, sandals or loafers. The PLAY letters were built by Rainier Industries from wooden frames wrapped with Italian bending poplar. Art on the words by DSA staff depicts a playful Puget Sound landscape with wildlife and colorful, faux-3D letters. Together they form an eye-catching reminder of the importance of fun in the midst of life’s daily bustle. You can see and enjoy PLAY in both parks through July 2019.